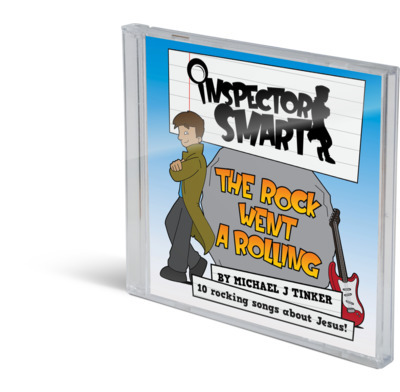 Inspector Smart and his sidekick, Mikey, present "The Rock Went a Rolling"
You can also join Inspector Smart and his sidekick, Mikey, on this new CD “The Rock went a Rolling”. Smart and Mikey introduce 10 fun songs about a wide range of Bible topics, sung in an even wider variety of style. The parable of the hidden treasure is retold as a pirate sea-shanty; discontentment explained by a barbershop quartet; the book of Revelation is rapped; and Jesus’ command to “do not worry” is given reggae vibes! Michael Tinker and Inspector Smart would love to come to your church or school on the 'Rock Went a Rolling Album Tour'. If you'd like to invite them, please send Michael an email. Here's a message from Michael and Inspector Smart to let you know what you can expect! 5. How can we know about Jesus?